Taizhou Yihao Steering Gear Co., Ltd.
Power steering racks, manual steering racks, steering joints and yokes, steering gears, steering system parts, steering pinion assemblies etc. Jun 10, 2015 | By CENS | TAIZHOU YIHAO STEERING GEAR CO., LTD.
Taizhou Yihao Steering Gear Co., Ltd., established in 1991, is an ISO/TS 16949:2002-certified company specializing in manufacturing a wide range of automotive steering system parts. 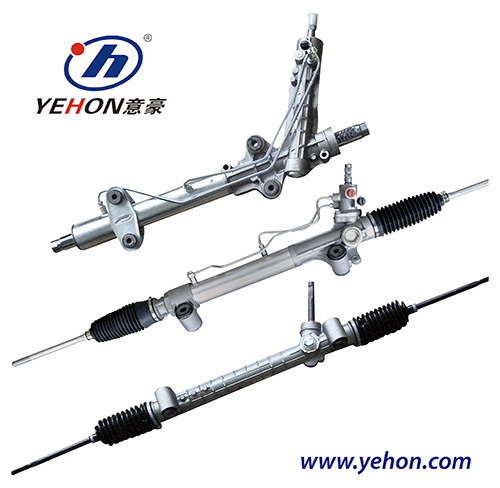 While able to offer all kinds of steering parts, the firm mainly supplies power steering racks, manual steering racks, steering pinion assemblies, tie rod ends, side rods, rack ends, idler arms, pitman arms, tie rods, ball joints, ring-gear connectors, among others. Backed by vigorous development over the past years, the company has grown into an integrated enterprise able to develop and manufacture products to compete against any peer, coupled with a seasoned sales team to provide practical service and consultation to customers. Yihao operates a modern and integrated plant in Kamen Technological Industrial Zone in Yuhuan, Zhejiang Province of China, whose total floor area exceeds 10,000 square meters. The facility employs around 500 skilled people, including five senior engineers, 45 administrative staffers, and about 60 senior technicians. The operation includes R&D, testing and inspection divisions to ensure quality and high precision. The plant is equipped with advanced, highly-automated production and assembly lines to fully demonstrate Yihao's highly efficient, systematic production, backed by technicians who work hands-on to guarantee production stability, qualitative consistency, and safety of products. Yihao consistently upgrades products and technology to facilitate building of long-term trust and partnerships with customers worldwide, especially in major markets such as Europe, North America, Latin America, the Middle East, Africa, and Southeast Asia. The reputable steering-rack maker insists on doing business by optimally tapping technology and human resources to build trustworthiness and be accountable by developing precise, safe products. Kanmen Science & Technology Industrial Zone, Zhugang, Yuhuan, Taizhou, Zhejiang Province, China.